Knowledge has intricate linkages with forces that govern our social life. Invariably, the production and denial of knowledge are akin to the production and denial of power. For centuries, caste system in the Indian subcontinent has controlled, regulated and hierarchised knowledge. Brahmanism, as it evolved over a period of time, has sought to legitimate the servitude of Dalit castes through its hegemony over the social universe of knowledge. Of course, the hegemony has seldom been complete or gone uncontested. Today dalits claim a stake, both in knowledge and the power that it serves more strongly than ever before. Right from the nineteenth century, dalit discourses have emerged as challenges to the Brahmanic-national-universal with distinct and dissenting imageries of future and the quotidian, the community and the nation. Violence and at times token concessions have been the usual response of the powers that be to such dissents. It was a ploy of the dominant and not really commitment to incorporate dalit thinkers, ideologues and fighters in Social Sciences. A programme of Dalit Studies that aspires to be emancipatory, seeks to challenge and change the very edifice of Social Sciences. In its efforts it must resemble the de-Brahmanisation of knowledge. It cannot be just an addendum to the existing system of knowledge. The Report engages with this issue and attempts to draw the contour of Social Sciences of the future. Based on year-long discussions and deliberations with hundreds of university teachers, vice-chancellors, intellectuals, social-political activists and government officials, the Report presents the case, problems and challenges in introducing Dalit Studies in the higher education of Bihar. It is useful for scholars, researchers, policy makers and educationists working in the field of pedagogy. 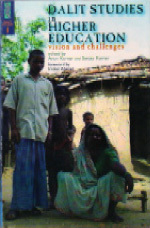 Arun Kumar is the author of Rewriting the Language of Politics: Kisans in Colonial Bihar (Manohar, 2001), Violence and Political Culture: Politics of the Ultra Left in Bihar (Economic and Political Weekly, 22 November 2003), and Beyond Muffled Murmurs of Dissent: Kisans in Colonial Bihar (Journal of Peasant Studies, October 2000). He has been working on issues related to dalits and social conflicts, communalism and alternative education.